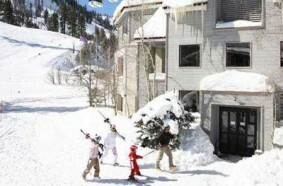 Squaw Valley Lodge offers Lake Tahoe visitors a charming stay on the slopes of the Sierra. You will find ski-in/ski-out accommodations, while the lodge’s fireplace and balcony can both offer unique ambiance. Furthermore, Squaw Valley Lodge features kitchenettes complete with standard kitchen amenities and utensils to ensure that gourmet dining is never out of your hands. Find a superior stay waiting for you in Lake Tahoe, CA with the Squaw Valley Lodge.